At Laser Plumbing Newcastle Central we are passionate about installing healthy and great looking rainwater reuse systems. We encourage the efficient use of water and have become experts in installing rainwater tanks for homes, schools and businesses. Per capita, Australia is one of the world's greatest consumers of water. In the blistering summer heat, and particularly during droughts, most of us find that relying on the mains water supply is simply not sufficient. Additionally with the increase of the cost of water, the installation of a rainwater system is a practical investment to reduce the cost of living for you & your family. Flushing the toilet, washing your clothes, watering the plants or washing the car: These everyday activities don't require mains drinking water. In fact, 40% of your property's water supply could be replaced with rainwater - safeguarding your supply during droughts. By connecting a water tank to your toilet, washing machine or hot water system you can significantly reduce the amount of mains water you use, cutting your water bill in the process. When water is restricted, having your own water supply is the best way to keep your garden flourishing. During heavy rain, stormwater runoff causes significant damage to our creeks and waterways. 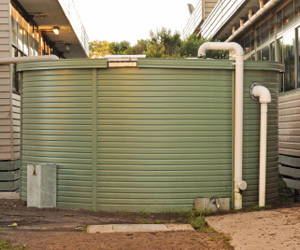 Water tanks collect approximately 80% of all rainwater that falls onto roofs connected to gutters and drains...and the more rainwater we collect, the less damage we can expect from stormwater. Thinking of installing a rainwater reuse system in Newcastle? If you have a project in mind and would like a quote please contact us. We are more than happy to visit your property, lend our expertise and find the best solutions for you.